PTACEK Home offers general contracting services and custom furniture, covering all aspects of building and design. In business for over 25 years, we take pride in developing long-term relationships with our clients. Committed to making deadlines and staying on budget, we also accommodate to changing circumstances. To assure the success of each project, we work closely with our clients in a collaborative and professional manner. Our Hudson Valley studio was founded by master homebuilder and furniture designer, Thomas J. Ptacek. Tom and his team of craftsmen combine traditional craftsmanship with modern technology to fit each unique project. 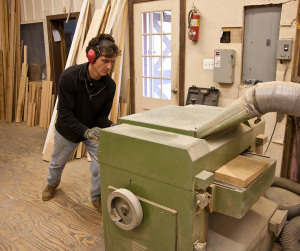 We have our own tree-milling and molding capability, which allows us to repurpose salvaged materials and storm downed trees. From historic restorations, to newly constructed contemporary homes and furniture, to Mahogany libraries, to custom kitchens and cabinetry, every detail is carefully executed. Guided by Tom’s exacting eye for detail, PTACEK Home reflects our deep commitment to structural integrity, meticulous joinery, and hand-applied finishes. Serving as an exclusive source of artisan-built furniture and cabinetry, PTACEK Home honors the natural beauty, strength, and graphic patterns inherent in wood. Our portfolio of one-of-a-kind tables, seating, beds, and case goods are sought by privatecollectors, architects, and designers of quality interiors. Conveniently located in the lower Hudson Valley, PTACEK Home has completed a wide variety of jobs throughout the New York Metropolitan Region. For additional information or to schedule an appointment, please call 845.424.6112. The story of the wood continues in PTACEK Home’s building and furniture — and in your home. Copyright 2016 Ptacek Home, Inc.